I have a Sauromatun venosum tuber and was wondering when I should pot it up in the greenhouse. It has started to grow. About 2 to 3 inches. it is a greenhouse, hot or cold. you put it at dormancy at what temperature ? It's in a cool cupboard in the kitchen at the moment at about 10 -15 degrees. My greenhouse is fluctuating from 4 - 14 degrees, night- day at the moment. The tuber is a recent purchase so it was already in dormancy when I got it. Mine's been growing in the garden for 10 years, with no protection! Thanks Rob. 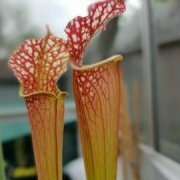 I'll pot it up and pop it in the greenhouse for now, followed by some Arisaema and Amophophallus in march. Not grown aroid before so it's a little experiment this year. Yes, my plants outdoors must be 20-30cm deep. Thanks for your help you two. I'll pot it up maybe in a week or two then and stick it in the greenhouse so that it is protected from any frost.